After spending the largest part of the day in the ice, we gave up finding a Polar Bear. Apparently they didn’t want to show up, even though there was enough food for them. However, the day wasn’t over yet! While we were just sitting in the bar, somebody looked out of the window and shouted: “A WHALE! !” We immediately called the expedition leader, so we could change course and try if we could get a bit closer. When I passed her on the stairs I said “A whale on port-side, not too far and it’s pretty big….”. Well, I was right with that last part… When we came a bit closer, Jordy, our whale expert, asked me if the whale was black or not. When I replied it wasn’t the ID was made, a Blue Whale! The largest animal that has ever lived on the planet, just a few meters in front of the ship! It didn’t seem to be too bothered by us as it continued feeding for quite some time. Meanwhile we got great looks at him (or her). Blue Whales normally don’t give away a great show, but it was a great experience to be for some time this close to one of these rare giants. Sometimes a Brunnich’s Guillemot or Little Auk was swimming next to the whale, this showed even better the size of these animals. In this picture there is one on the left hand side of the whale, hardly visible at this size. 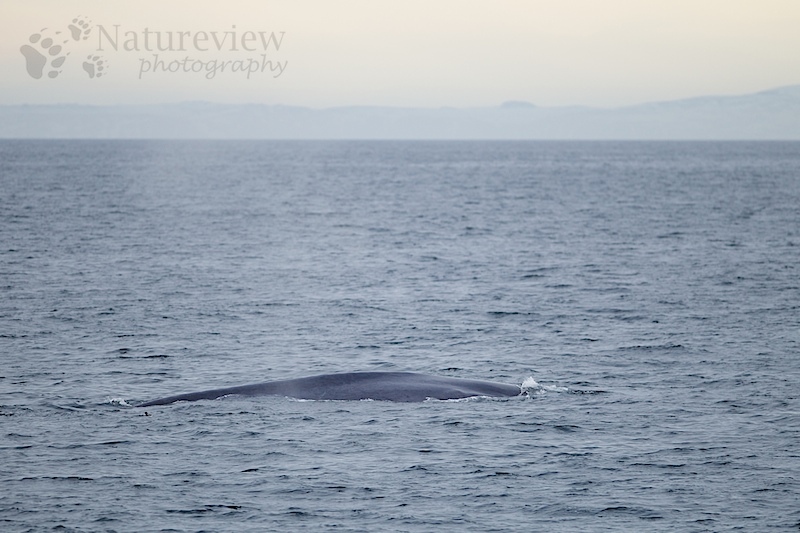 So in the end we had a great day, with our first Hooded Seal and my second Blue Whale, both performing nicely. However, still no Polar Bear…. Mooi, machtig beest is het. Is dit de walvis met het aangroeisel op zijn vin? Die zagen wij paar weken geleden ook in het noorden.